For the thirteenth consecutive year, Saint Mary's University students have proudly represented their respective provinces and countries of origin as active and engaged participants in the Northern Ireland Peace Education Program—a long-standing collaboration between Saint Mary's University and Peaceful Schools International. The latest contingent of program participants is Saint Mary's largest to date. 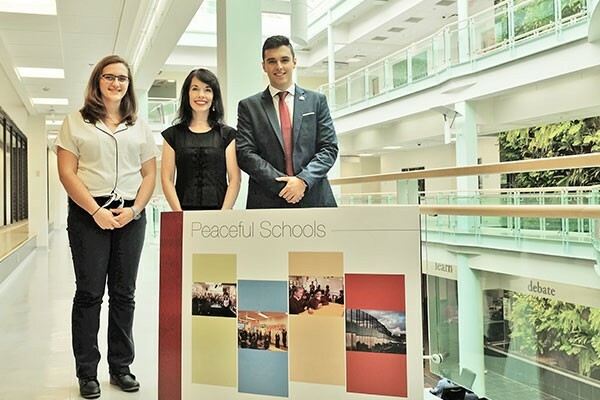 There are 28 SMU students who collectively demonstrated excellence in the promotion and facilitation of peace education initiatives in the university's home town of Halifax, and in Belfast, Northern Ireland. "These university students deserve our deepest admiration for all they have done locally and internationally in the name of teaching conflict resolution skills to younger generations. It is without question, with the current state of world affairs, any efforts to promote peace education among younger generations can only be viewed as highly beneficial," says Bridget Brownlow, Conflict Resolution Advisor and a professor in Political Science, Irish Studies and Education at Saint Mary's University. "The Saint Mary's University Northern Ireland Program would not be possible without the long-term generosity of many individuals and organizations. We are especially grateful to the Donahoe family, who are trustees for the estate of Patrick Power, and to the Charitable Irish Society of Halifax," she says. Not only has this initiative inspired a new minor in Peace and Conflict Studies within the Faculty of Arts at Saint Mary's University, it has additionally presented a unique opportunity to design and develop a second international course in Northern Ireland. In that course, Saint Mary's students will concentrate on learning about the events and challenges connected to the annual commemorative proceedings surrounding the impact of events directly associated with the 1690 Battle of the Boyne in Northern Ireland. "Our aim with this second academic program is to expand upon existing opportunities for experiential and service learning, while upholding excellence in academic standards," says Brownlow. In the Northern Ireland Program, Saint Mary's students volunteer to create peace education and conflict resolution workshops. The students use the workshops in Halifax elementary schools, then take them overseas to schools in Belfast. Patrick Guerra, who is currently enrolled in the minor of Peace and Conflict Studies, says, "The greatest thing about the program is the possibility to give back to the community and the idea of inspiring the children, showing them that is possible to be whoever they want to be." Guerra says that Peace and Conflict Studies, along with his majors in Economics and International Development, have given him a good base to understand how the world works and what he can do to help. Michaela Peters, a fourth-year Anthropology and International Development Studies student, says SMU's collaboration with Peaceful Schools International not only inspired her Honours Thesis topic—The Culture of Conflict Resolution in Halifax Elementary Schools—but also what she would want to do in the future. Peters volunteered with Peaceful Schools International and travelled to Belfast in 2016. "When I first started working with Bridget, I'm pretty sure I went home one day and said, if I could have a job like hers I'd be happy. I want to help people live in communities where they get along with one another and have the skills to work out their conflicts peacefully. Currently, I am looking at job opportunities with organizations like ISANS, the YMCA or other community groups," she says. Peters says she wishes every student could understand the legacies left behind by conflicts like those in Northern Ireland. Her hope is that through study and education, the world will learn to be able to avoid similar conflicts in the future.